The 2015 rosters for the Arizona Fall League were announced Tuesday. 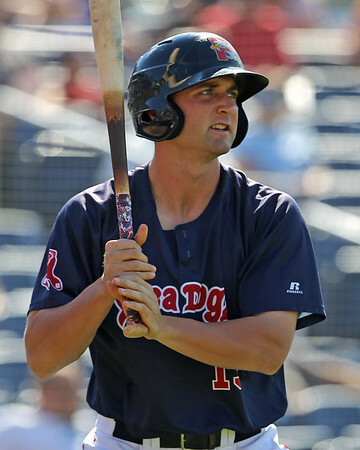 Six members of the Red Sox organization have been assigned to the Surprise Saguaros: first baseman Sam Travis (pictured), second baseman Carlos Asuaje, shortstop Tzu-Wei Lin, and pitchers Chandler Shepherd, Kyle Martin, and Aaron Wilkerson. Travis is the most highly regarded player in the group. The 2014 second-round draft pick out of the University of Indiana has lived up to his reputation as an advanced college hitter. He has risen quickly in the system, playing at four levels in only a season and a half and reaching Double-A Portland just a little over a year after originally signing. He has hit at every level, including a .294/.366/.429 line in 61 games with the Portland Sea Dogs. Travis is currently ranked the 10th-best prospect in the system by SoxProspects.com and was named the site's Player of the Month in June. Asuaje has shown an advanced approach and a solid all-around game since being taken in the 11th round of the 2013 draft. After splitting his first two seasons in the organization between second and third base and left field, he has been almost exclusively a second baseman for the Sea Dogs in 2015. The 23-year old has a .254/.336/.376 this season, including a 29-game on-base streak from late April into May. It has been something of a comeback season for Lin. After signing a $2.05 million bonus in June 2012 just before the new international bonus pool rules wen into effect, he struggled mightily, posting slugging percentages below .300 with Lowell and Greenville in 2013 and 2014. His bat showed its first signs of life with Salem this season, as the 23-year-old hit .281/.331/.367 with two home runs, matching his previous career total. Shepherd joins Travis in representing the 2014 draft class on the Saguaros roster. A right-hander, reliever, Shepherd was assigned to Greenville out of spring training, but after 14 2/3 innings in which he struck out a quarter of the batters he faced, he was promoted to High A Salem. The former Kentucky Wildcat continues to flash excellent strikeout and walk totals, with 43 punchouts and only six free passes allowed in 49 1/3 innings since the promotion. Martin is hoping to become the third player drafted by the Red Sox out of Texas A&M to reach the majors in recent years, joining fellow hurlers Alex Wilson and Casey Fossum. Martin, a ninth-round selection in 2013, has a 4.12 ERA this season in the Portland bullpen. The rest of his stat line is more impressive, however: in 39 1/3 innings, he has 44 strikeouts, 12 walks, three home runs allowed, and a .252 opponents batting average. The most unlikely member of the squad would seem to be Wilkerson. Little was known of the six-foot-three right-hander when he was signed as a 25-year-old out Grand Prairie of the independent American Association to fill a hole on the Short Season-A Lowell roster. After dominating the much younger hitters of that circuit in 2014, Wilkerson has continued to impress this year across three levels. Moving between the rotation and a piggy-back role with Greenville, Salem, and Portland, he has a 3.22 ERA and 129 strikeouts in 125 2/3 innings. The Red Sox will likely add two more players to the roster between now and October 13 when the AFL season begins. The Saguaros will be managed by longtime major leaguer Delino DeShields.